Does wind energy pose a threat to wildlife? As a means of harnessing renewable energy, wind turbines tick many of the right boxes – but a new study from the US raises questions about their impact on wildlife – on bat populations to be precise. Researchers at the University of Colorado (UC) Denver estimate that in 2012, wind turbines killed over 600,000 bats. While many people may be scared of bats, perhaps because of how they are portrayed in films and books, the flying mammals play an important role in crop pollination and pest-control – they are voracious predators of night-flying insects. Is wind energy a threat to bat populations? Can wind energy and wildlife coexist? The bats are killed when they fly into the wind turbines which spin at up to 179 mph with blades that can stretch 130 feet. Dr. Hayes says dead bats are being found under wind turbines all over North America. He also reckons the 600,000 deaths a year in the US is a conservative estimate because for their study they only took the lower figure in the range of deaths estimates reported by wind farms, and they also only covered migratory periods and not the whole year. “The number could be as high as 900,000 dead,” he suggests, and as more and more wind energy plants are built, those numbers are likely to rise. Dr. Hayes, who has been studying bats for 15 years, says one way to reduce the deaths is to have the turbines spinning only at higher wind speeds when bats don’t fly much. 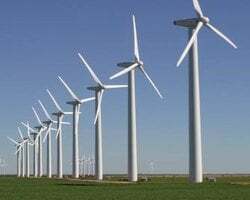 He says in a study done recently in Pennsylvania, researchers changed the wind turbines so they only turned when the wind speed was 18 or 20 mph instead of the usual 10 mph. Bat deaths reduced by between 40 and 90%, he notes. “Still, I think this is a problem we can solve,” he adds with a note of optimism. The study is due to be published next week in the journal BioScience. Wind energy is all about harnessing the energy in moving air, i.e., the wind, and converting it into electricity.